I love Christmas – it’s my favourite time of the year. I love the look, the sound and the smell of it. I love decorating the rooms and putting up the tree, hearing all the Christmas carols and even look forward to the cheesy pop songs. 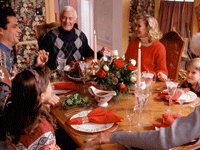 I especially love the aroma of festive food and sharing it all with my family and friends. But what about our pets? Do they enjoy Christmas as much as we do? 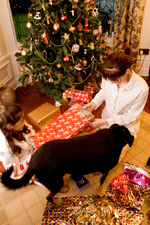 How can we provide a happy, stress free Christmas for pets? Pets are not the best at coping with change, so if you have a pet that has never experienced Christmas before, think about how it may appear through their eyes, ears, and nose…. 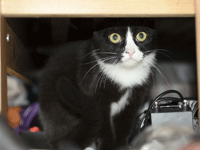 Strange things suddenly materialise around the house that your pet may never have seen, heard or smelt before. A tree may appear looking and feeling a bit like the ones they like to scratch, climb or pee on but this one has flashing lights and enticing things that dangle. Unlike our pets’ experience with other trees this one may cause owners to become anxious or cross if it’s scratched, played with, climbed on or used as a handy toilet. Children act excitedly and unpredictably and are around a lot more than usual. Our pets won’t understand why a tree has suddenly appeared in the house! Lots of often-unfamiliar visitors come to the house carrying strange boxes. Owners may act differently to normal. They might become overly excited, at times become tense and may even burst into song. Furniture and pet beds may be moved and new ones added that might not look or smell familiar. There are great cooking smells but frustratingly a no show in the food bowl. And rolled up paper tubes go BANG. 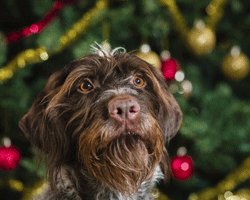 It’s no wonder that some pets may show signs of stress during the Christmas period. But how can we tell? 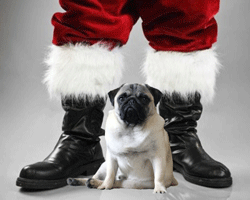 So how can we help reduce Christmas stress for our pets? Start by beginning the preparations early and change the way your house looks gradually over a period of weeks instead of all in one day. Place small animal cages in a quiet room away from the hustle and bustle but make sure they still have lots to occupy them. 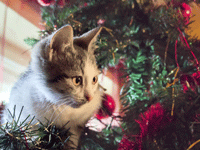 Stand your tree in a wide bowl of water as this may prevent your pet from getting too close. Make sure tree decorations are non-toxic and that includes chocolate decorations and certain plants such as mistletoe and holly. For your cat, offer an alternative scratching post and extra dangling toys to play with. Sprinkle with catnip powder to transform the new post into your cat’s very own festive tree and to encourage use. Make sure your pet has their own safe quiet area and leave it unchanged with plenty of familiar smelling blankets and a few items of your unwashed clothing to snuggle up in. It is important that they have somewhere to retreat if the festivities become too much to cope with. Keep to your pet’s normal feeding and exercise routines. Offer fun puzzle toys for your pets to play with to help keep them content as the world around them changes. Ask visitors not to make ‘friends’ with your pet by stroking or trying to pick it up but offer a few tasty treats instead that you have prepared as part of your pet’s daily food ration. On Christmas Day, have a few loosely wrapped presents so your pet (if able) is happily distracted whilst the rest of the family are opening theirs. A new puzzle/activity toy is a great idea, as you can use your pet’s own allotted amount of food to keep them occupied during the day. Be careful when giving your pet human food. A few small pieces of chicken or turkey is fine but do not over indulge your pet and keep all sweets, alcohol and hangover cures safely locked away. This is not the best time to acquire a new pet so wait until this busy season is over and life has returned to normal before introducing a new animal friend into your life.